PanARMENIAN.Net - -Why Azerbaijan and Armenia don’t hold talks on the Nagorno Karabakh conflict settlement directly with each other? Because they hold separate meetings to discuss the couple of provisions they can’t agree upon. The process is rather intense at the moment. -Our goal is to show the people and unsettlement of social issues and migration, which makes families split, happen because the Karabakh conflict is not resolved. Dozens of thousands of young men are serving in the army. How can’t people understand the value of this peace? -The nation should be prepared for painful solutions and compromises. Both sides will not be pleased. If territories are given for independence, most civilians and politicians in Armenia will be displeased. If Azerbaijan gets territories but will have to recognize NKR, it will arouse people’s discontent. Thus, there will be no ideal solution. -Get rid of ambitious politicians; ordinary people comprehend the situation much better. -We support the current authorities only in Karabakh settlement issue and no other. We will never form a coalition with the Republican Party. -The decision which is negotiable now can become obliging in the near future. -If we don’t give the lands voluntary, they will be seized under sanctions. Is Armenia the country to fling the gauntlet to the international community? Can we bring to knees the UN, OSCE, U.S., Russia or France? It will be impossible to keep these territories even if Baku is invaded. -Those who say “not an inch of land” are the nation’s gravediggers. We have already seen such patriots. They didn’t give the territories but had given away the whole country. -Stepwise resolution of the conflict is a norm that has been numerously applied. Post-war problems should be resolved first of all. Then the status will be determined. I don’t eye this solution as ideal, but it’s satisfactory. -The principles of Key West and Madrid were proposed after me. Now it turns out, it was me but not Oskanian, Kocharian, Sargsyan and Ghukasyan, who gave away the lands. -During the April war, many forces were disappointed that Armenia didn’t suffer a devastating defeat. They were waiting for a setback that will dethrone Sargsyan and bring them to power. On the contrary, I am ready to help an enemy to rescue the nation from new evils. 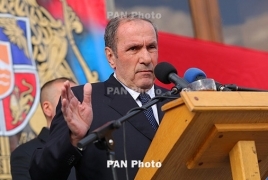 -The phenomenon of Gagik Tsarukyan can’t be explained in political terms. The people like this man and that’s all. It’s an unexplainable fact. -Vartan Oskanian accepted return of territories in Madrid principles but doesn’t talk about it now. It’s not fair. The same story is with Ohanyan, who, being a part of the system, never protested the pursued policy. Today, these people pose as honest and clean. It should be also noted here that YELK bloc thinks that the Karabakh issue is unresolvable while the Armenian Renaissance party doesn’t say a single word about the conflict in its election program.